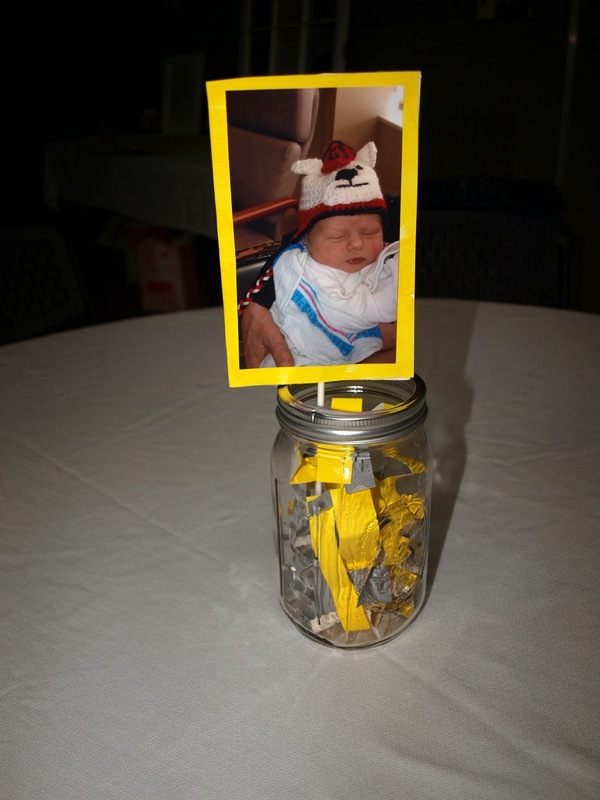 Our Life on a Budget...: BD's 1st Birthday! 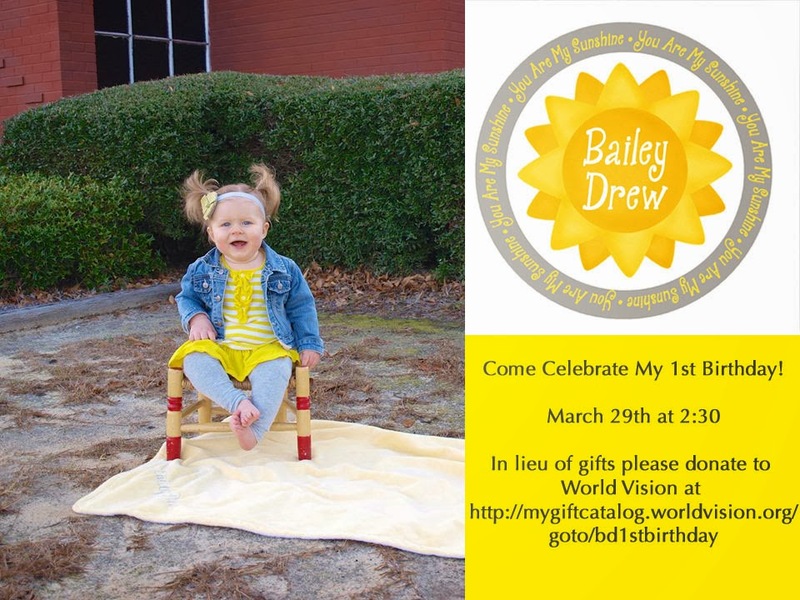 We just celebrated Bailey Drew's 1st Birthday this past weekend! 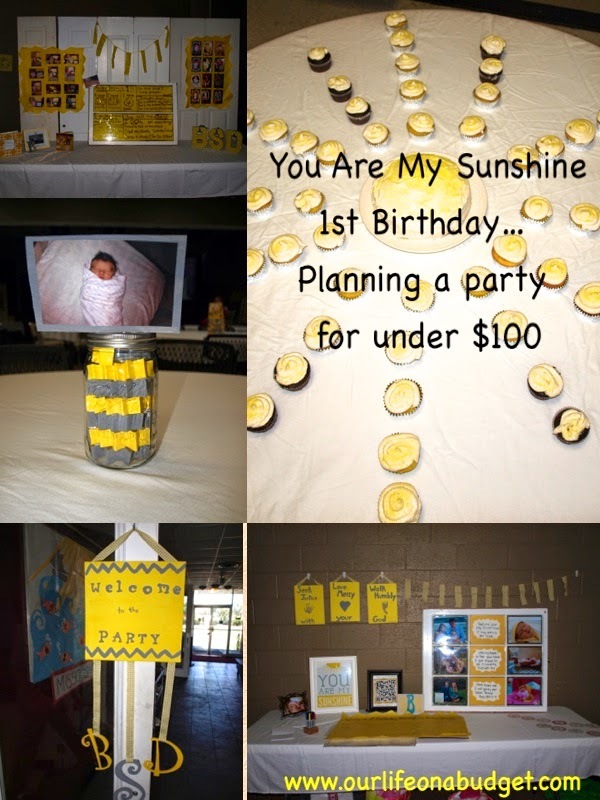 Some time ago I shared how we planned to do this birthday on a budget… under $100 to be exact. 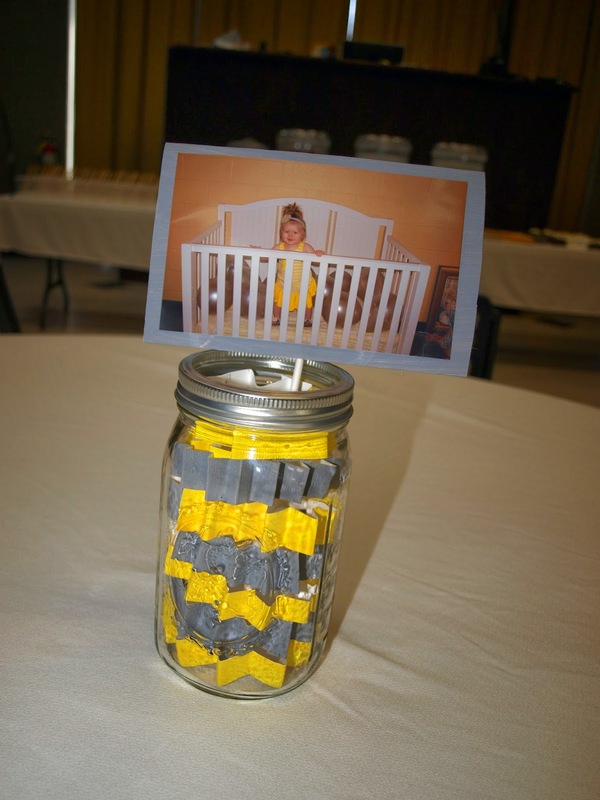 And guess what… we did her birthday for under $100… for over 60 people! We are so blessed with great family and friends! And we had SOOOOOO much fun! Here are some of the things we did. The 2 biggest pieces of advise if you are trying to do a birthday on a budget. 1) Use what you already have. 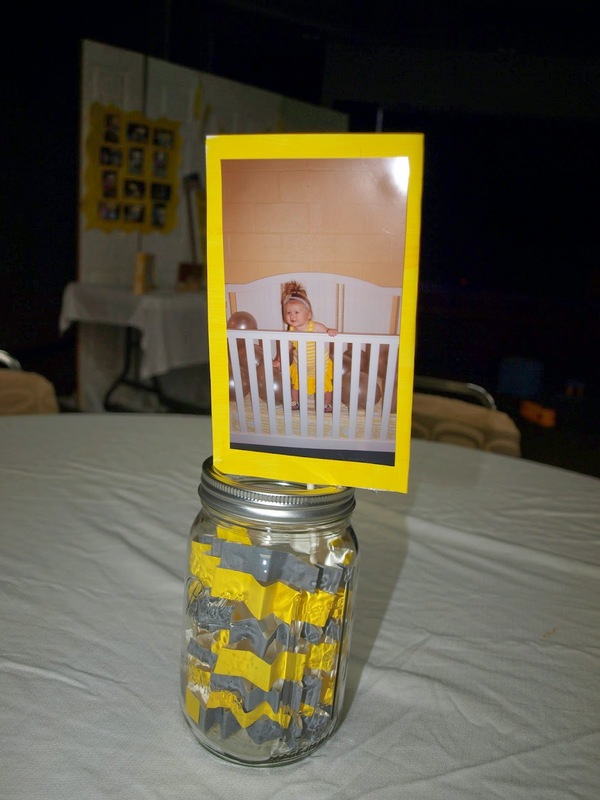 We matched our color scheme and theme to BD's nursery (yellow and gray "You are My Sunshine :)")… so we already had almost all the decor supplies. I also used some food items we already had. 2)Keep it simple. As you go through the process to will see a million + 1 things you need to add… you don't actually need them… don't go overboard! 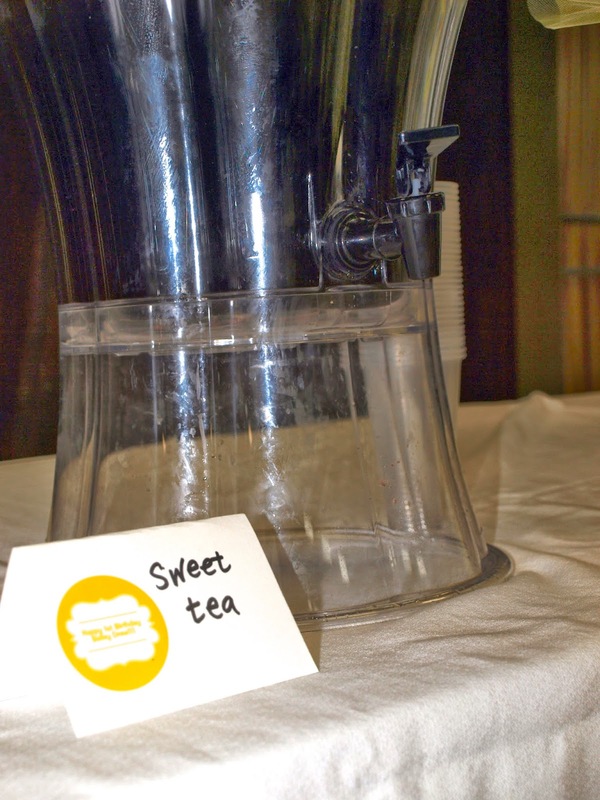 So here is a synopsis of our party budget break down… like I said it was such a fun day! Gifts: So we intended to ask guests to donate to Samaritan's Purse or World Vision in lieu of gifts. 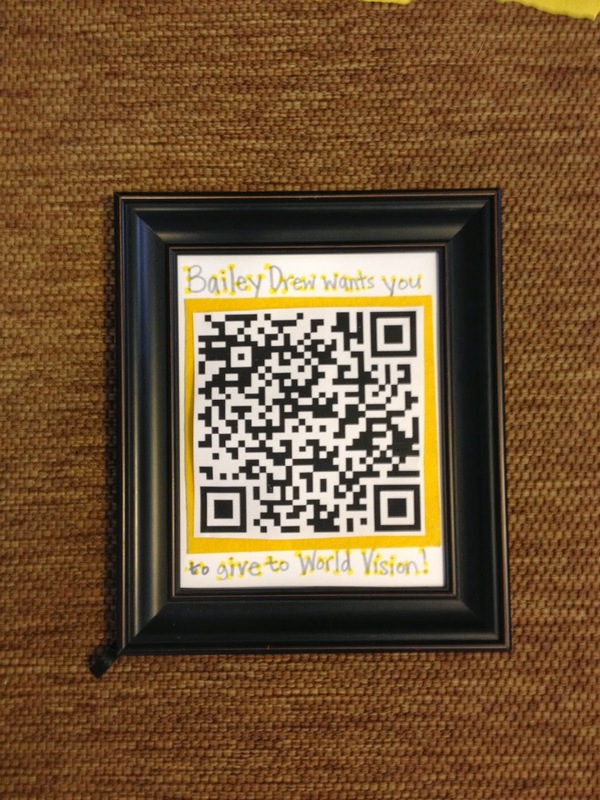 We ended up putting Word Vision on the invites, but accepted donations in lieu of gifts to any charity. 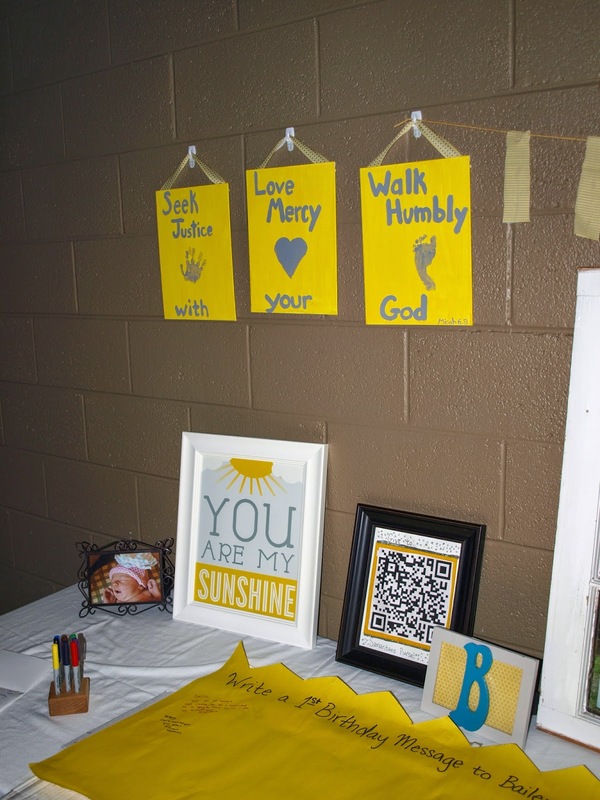 On your gift table make a scannable code so people can give right there at your party. 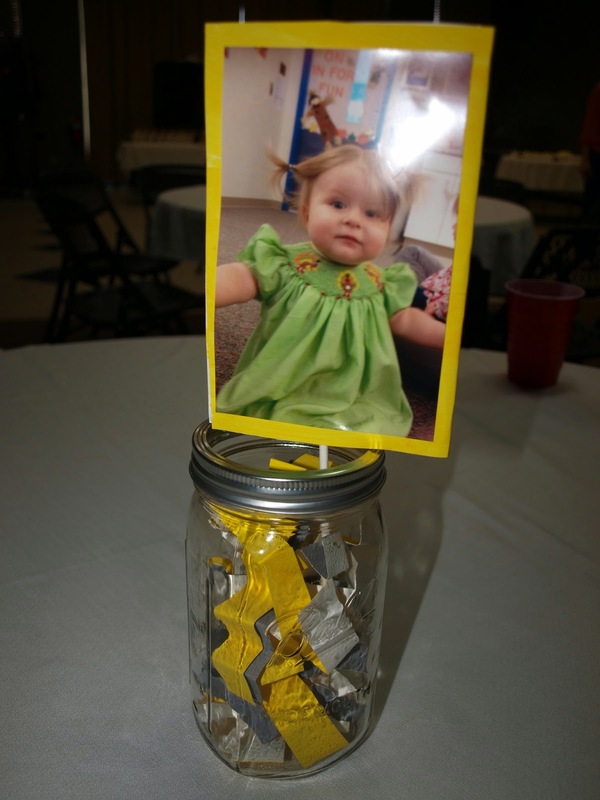 It is exciting to say that we raised over $300 for those in need through various charities! Outfit: Soooooo… Andrew's mom bought us this sweet dress off of ETSY… so we didn't have to. Let's talk about how this is the cutest outfit ever. I also got this sweet shirt from the IttyBitPress (also on ETSY). A sweet friend of ours makes heat pressed shirts and you should support her business too! 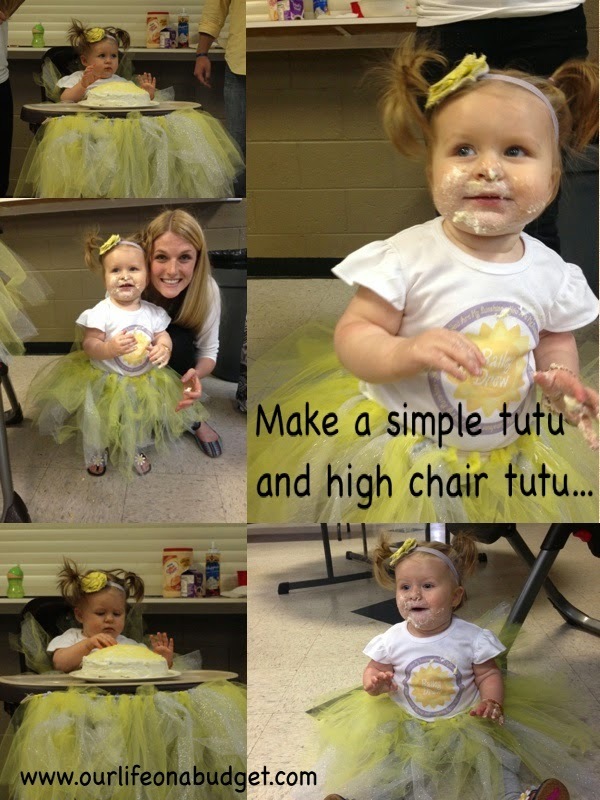 Any ways, I also made BD a tutu. It was super cute, but more expensive than I thought. I actually had to go back to Hobby Lobby and buy more tulle, so I definitely spent more than expected in this category! Simply take a piece of elastic and and tie pieces of tulle on it at the length you want… That simple. For he high chair we hot glued it on and it came right off! My mama and I made chocolate, vanilla and lemon cupcakes… and they were really good if I do say so myself! We also made a smash cake for Bails. We had tea, water and coffee to drink. Simple and sweet. 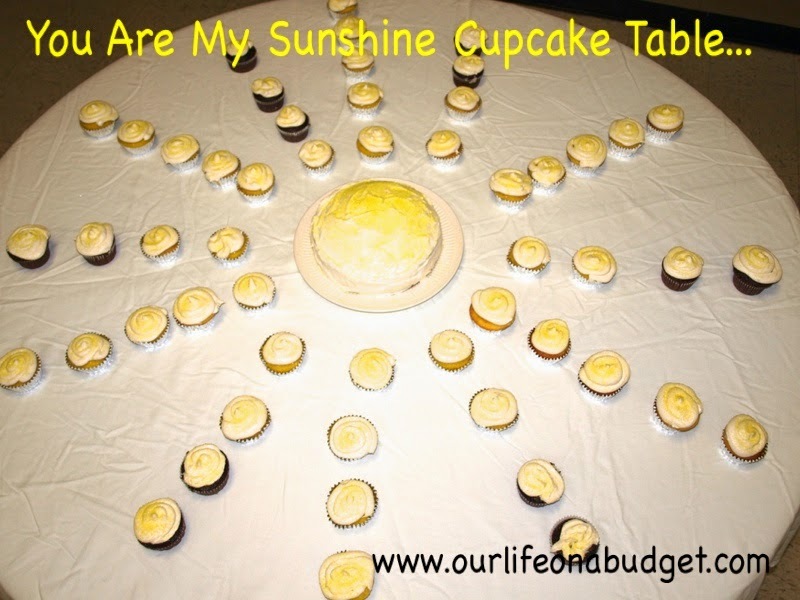 We put the cupcakes in the shape of a sun :). This was probably the biggest surprise. It is AMAZING how cheap and delisious homemade cupcakes are! Loved the invites. I used my ittbitpress design and put it on a simple picture invite! Ordered and sent them out. We also posted on Facebook. 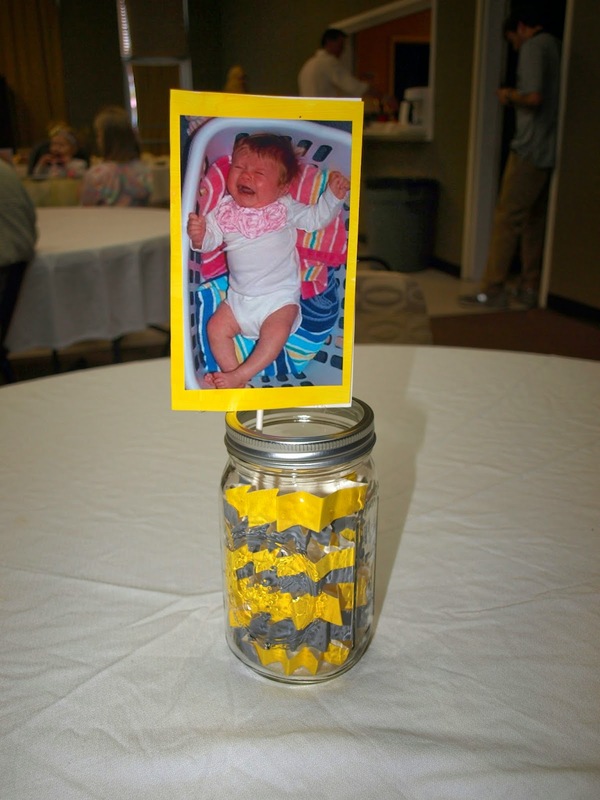 Decor: We used a lot of what we already had, since the theme of her party is the theme of the nursery. Below you can see all of our decor with descriptions! 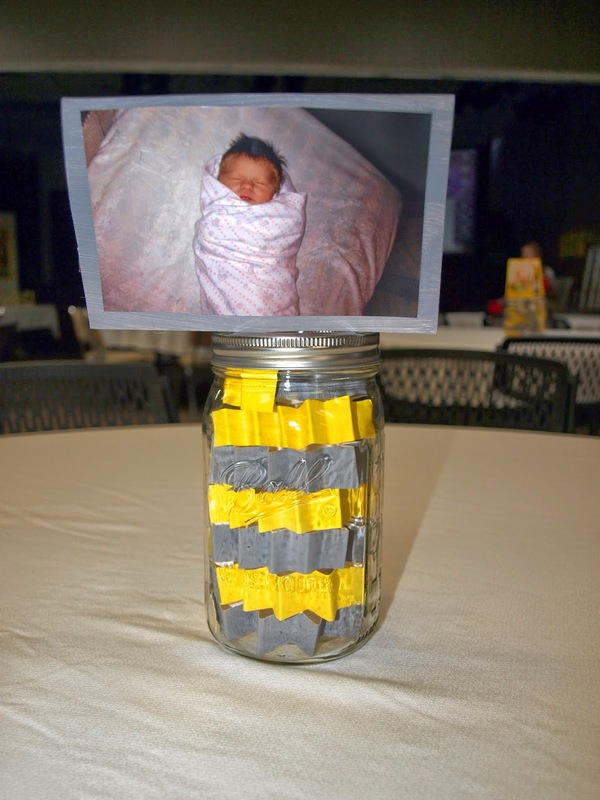 Great and easy alternative to those chalkboard memory boards. Back a window with colored card-stalk. Write directly on the window using dry erase. We just used window we already had in our house for decoration! 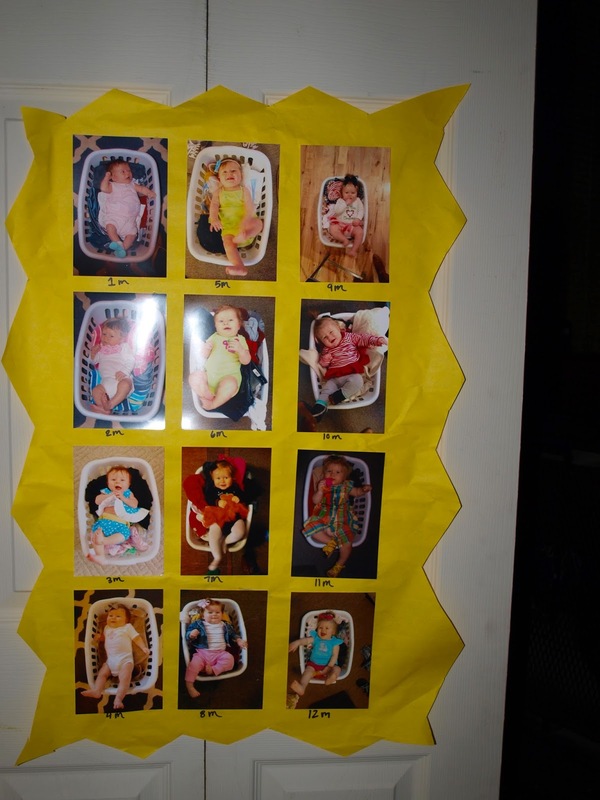 Easy month by month display… I late put these pics in the baby book! 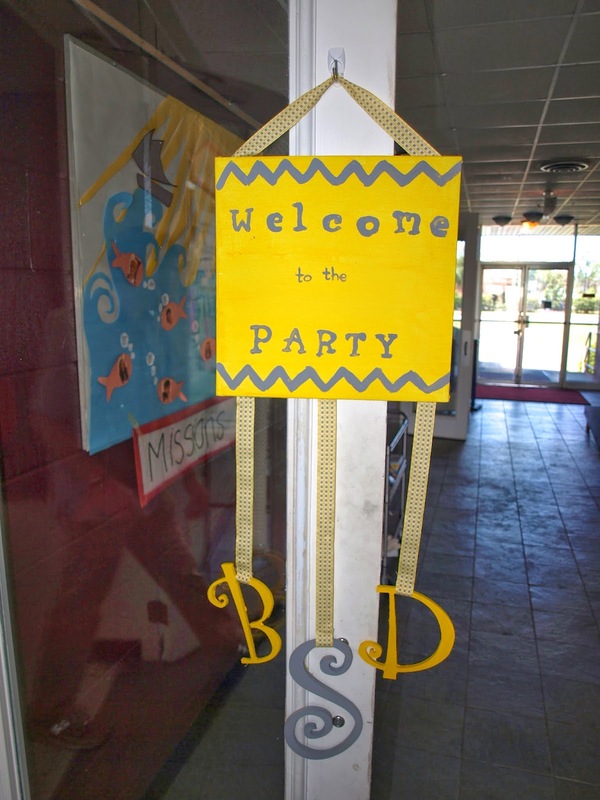 Easy welcome to the party sign. This is now hanging in the nursery repurposed as a bow holder! 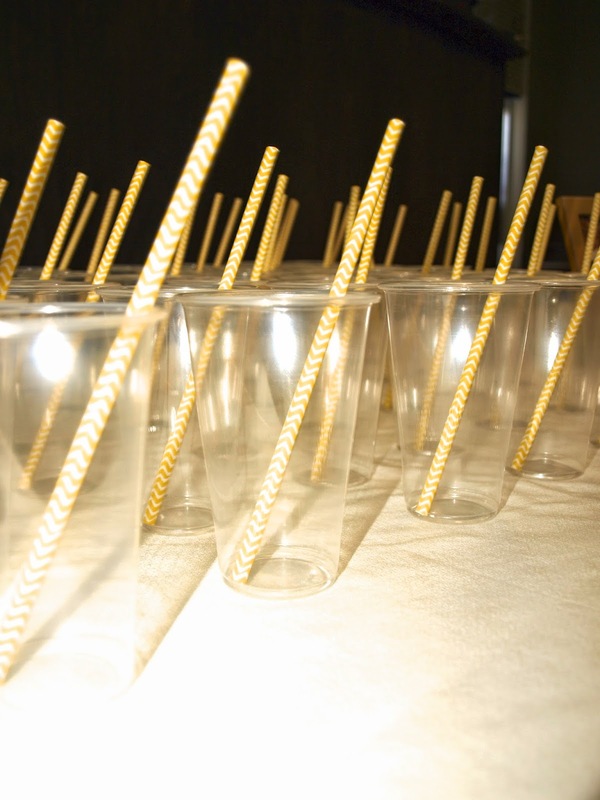 How do you throw a party on a budget without going overboard??? Stasia these are so great! 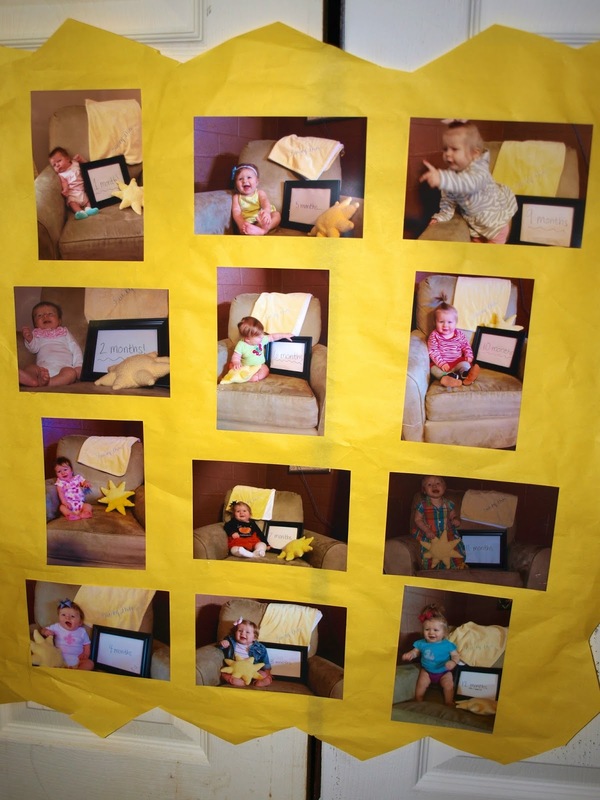 Also your family's picture with everyone is such a wonderful memory to have in a photo! OH MY!!! What a lovely party for your precious girl. I love all of the little touches! I love the colors. So adorable!! Thanks for linking up! I just found your blog through your BOTS interview. I absolutely LOVE the donation idea! Oh and I will take a homemade cupcake over store bought any day!